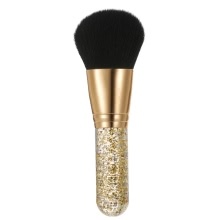 This nylon makeup brush is designed for foundation, blush and makeup powder, meeting your basic makeup demands. Soft brush hair gives you a silky touch feeling. Special handle makes it fashionable. Why not have a look now? [Multifunctional] Bushy and oblate, can be used as powder brush, foundation brush and even contour brush. [High quality] Made of nylon. Soft and fast drying. Cambered brush hair ensures a natural makeup look. [Fashionable] Its handle is decorated with shimmering powder, delicate and unique. [Durable] No hair dropping and won&apos;t deform easily after a long time use. [Portable] Mini size saves more space. Convenient to put into makeup bags. This product contains only 1pc brush.